Home > Blog > Gardening > Perenniels > Wormwood, mugwort or Powis Castle? I have been fascinated by the names given to these perennial shrubs. 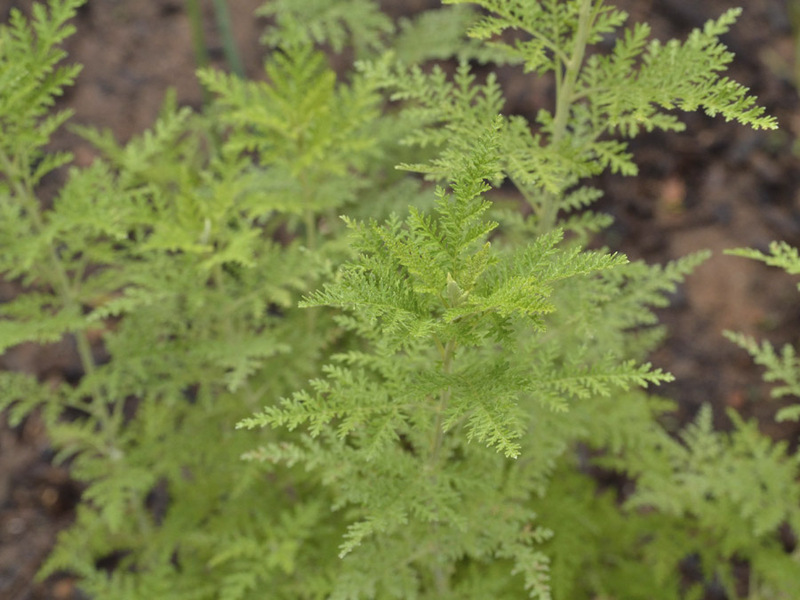 I found them in my favourite book by Margaret Roberts on “Companion Planting” and became interested in the Artemesia species because of their insect repellant and anti-fungal properties. Through my recent research, I came across some interesting information that I did not know about this plant!! Artemisia is a large, diverse genus of plants with between 200-400 species belonging to the daisy family. It comprises hardy herbs and shrubs known for their volatile oils, usually in dry or semi-dry habitats. The Powis Castle is commonly known as Wormwood – I thought they were different! Hmmm! As you can see below the Powis Castle (left) is very similar to the Wormwood (right). A hardy plant that can tolerate slight drought, it thrives in full sun and can tolerate partial shade. It is ideally planted in heavy clay that has been amended with humus and sand. The woody roots of this plant secrete a certain chemical that inhibits the growth of other plants around it. 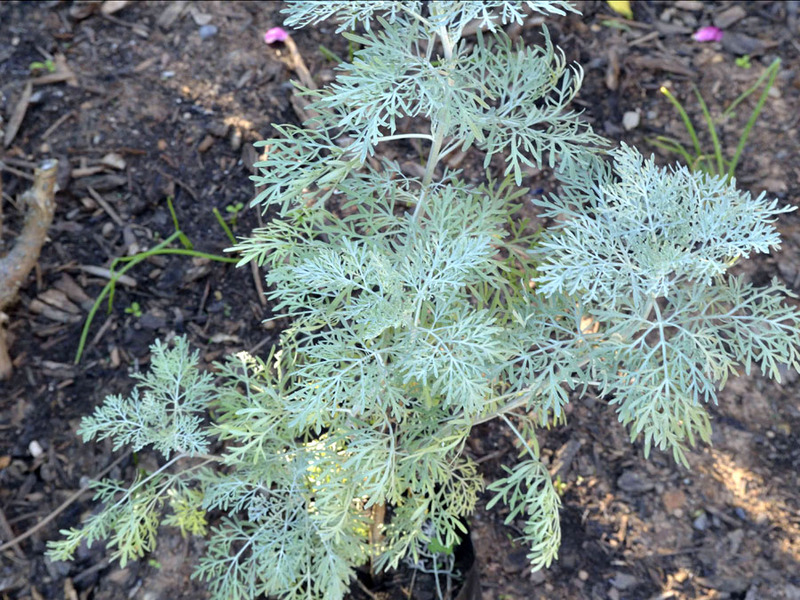 This is a unique weed-like characteristic of the Artemisia herb. The way the herb places chemicals into the soil has made it listed as a noxious weed, as the poisonous nature (hmmm….!) of its roots is treacherous to other plants. I better move this away form my roses, where I planted it!! The plant’s characteristic odor can make it useful for making a plant spray against pests. It is used in companion planting to suppress weeds, because its roots secrete substances that inhibit the growth of surrounding plants. It can repel insect larvae when planted on the edge of the cultivated area. It has also been used to repel fleas and moths indoors. In folk medicine, wormwood preparations are used internally for gastric insufficiency, intestinal atonia, gastritis, stomach. ache, liver disorders, bloating, anemia, irregular menstruation, intermittent fever, loss of appetite, and worm infestation. How amazing how the leaves of the plant can be both beneficial and health given and at the same time the roots can be poisonous! Nature works in mysterious ways! Maybe that’s why I lost some variegated Iris. I like the info on Powis Castle, that is, where the name comes from….Artemisia has been a stalwart in every garden I have designed or cared for. so interesting…..I thought vicks used eucalyptus leaves. Oh dear, not the iris! 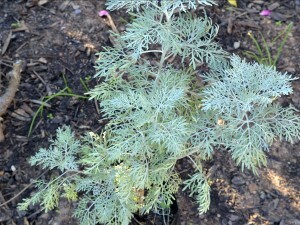 I best move my Artemesia to a isolated spot rather, where it will do no harm. I did find that if I just do a bit of research on the plants I like, I end up loving them more. thanks for your comment and by the way I love your African Daisies! Interesting information — a friend of mine loves Wormwood and had to hunt down some replacement plants; she’ll love seeing your post. Thanks for sharing!! I really enjoy the researching as much as the gardening….. No, not quite! Oh thank you for this. the gardens at Powis Castle are just breathtaking!! Mine is in the rose garden ‘near’ the roses. They all seem happy and the leaves smell ‘to die for doll’. It has claimed a large part of that bed, but it looks good and I love it. Great news …I will now leave my artemesia next to my roses. So my first instinct was right. Thanks for the help here! Thank you for telling us about this plant – fascinating! Well, I didn’t know it killed the plants around it – I have a couple in my garden. Now I’ll keep an eye out on the surrounding plants. If they start to decline, out it will go! I’m not sure if it kills plants around it or just prevents threm from thriving. I’ll do more research and do a follow up post. I’ve just come across a companion planting guide and Artemesia inhibits the growth of plants near it, so it doesn’t actually kill plants. This is one of the 3 herbs I grew up with and was given a tot every morning by my great grandma, then grandma and then mom and now I give my kids. I plant it in my veggie garden and it keeps the nauty bugs at bay. If I feel a dash under the weather, I will finely chop a leaf and sprinkle it over a salad or make the tincture. What a superb plant. A.afra is one of my favs. Great article. I did not know it repelled fleas and moths. Good to know. ‘Powis Castle’ is thought to be a cross between Artemesia absinthium and Artemesia arborescens. I love this plant, and it is not reliably winter hardy for me. I had my big one die this winter, and my little struggling one made it. Go figure. I’m not sure if the ‘Powis Castle’ has the plant-killing root property that you mention though. I have other plants growing around (and in) mine. Hi Alan, yes, I came across that informatuion too. I also love this plant and I have my new plant growing in a bald patch in the rose garden. Let’s hope that the roses do well with it. I was just telling a friend today that I’ve killed my fair share of Artemesia…I don’t have the touch it needs!